A newly-formed American investment company has confirmed it is considering a takeover bid for Tottenham Hotspur. Cain Hoy said in a statement it is in the early stages of assessing an offer. Spurs swiftly issued a statement saying they had met Cain Hoy representatives but added: "There are no ongoing discussions with Cain Hoy." On Thursday, the club denied that owner Joe Lewis was seeking to sell up amid delays to the construction of their new stadium. Spurs are currently trying to finance a reported £400m project to construct a new 56,250-capacity stadium. The existence of Cain Hoy was only made public in a statement released on Thursday which formally announced the launch of its operations. On Friday, Cain Hoy confirmed its interest in a takeover of Spurs but advised that the plans are "at an early stage". "There can be no certainty that any offer will ultimately be made," the group added. Cain Hoy has until 10 October to firm up its interest or withdraw it, in accordance with the City Code on Takeovers and Mergers. In their latest statement, Spurs said: "As stated in yesterday's announcement regarding the new stadium project, Tottenham Hotspur FC has been in discussions with multiple providers of finance so that the optimum financing package for the project can be achieved and, in the course of those considerations, has met representatives of Cain Hoy. "However, there are no ongoing discussions with Cain Hoy. "The club is focused on the new stadium development and the season ahead." 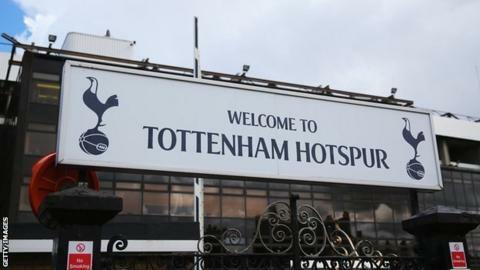 Tottenham plan to move out of their White Hart Lane stadium by 2017, but a legal wrangle means they will have to find a temporary home venue for the 2017-18 season.